This post has been read 258 times! 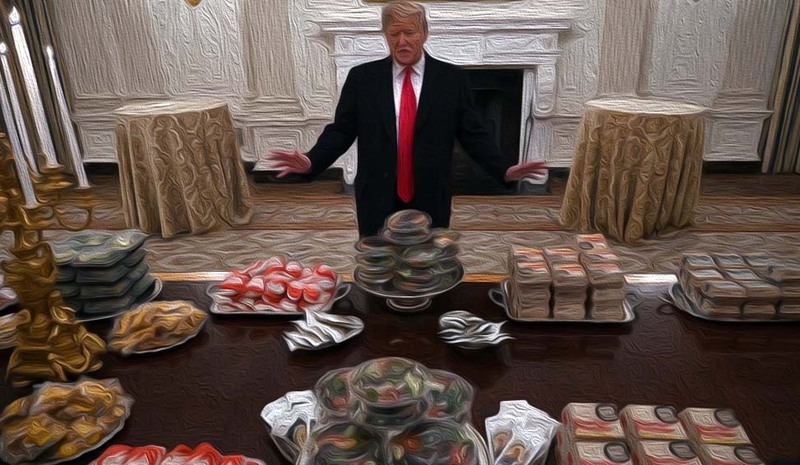 Making the mainstream news headlines is how President Trump fed the visiting Clemson football team a variety of fast food sandwiches as they visited the White House. He was likely trolling the Obamas who banned fast food. But Trump really eats this garbage himself. That is why he is obese and takes amphetamines to lose weight. Our president is literally being poisoned by the sugar in that fast food. The buns and fries are laced with sugar to addict people. The food industry has long known that sugar sells, even when concealed in what appears to be a meal. It increases hunger by spiking insulin. Like millions of Americans, President Trump is stuck in a vicious cycle and nobody around him cares enough to tell him. His senior advisors do nothing. He has the best team of chefs who could control every bite of food he eats, but he is too hooked on the sugar. This is like watching old Elvis deteriorate while his entourage watched. It is so vulgar to watch people eat bad food. It’s like watching a smoker or an alcoholic. Walk the golf course rather than ride in a cart. Avoid all food that is white, which means avoiding sugar, baked goods with sugar, fast food with sugar, bread, potatoes, and pasta. Those foods increase hunger by messing with the hormones of ghrelin and insulin. Eat instead a protein dish of chicken, fish, and occasional meat, with a salad or vegetable. The finest 3-Michelin-star restaurants know that the vegetables are the best part. Instruct his chefs at the White House to orchestrate this plan. Work on ways to reduce stress. Cortisol is released by our bodies under stress, which leads to rapacious hungers. The golf course is likely the best way he could reduce stress. This entry was posted in Food Essays, Political Essays. Bookmark the permalink. I thought they were fed fast food bc chefs are govt workers that have been furloughed? I also thought it was pathetic how MSM made this racist and sexist. Yes to both questions, but he really eats this crap.